We’d love your help. 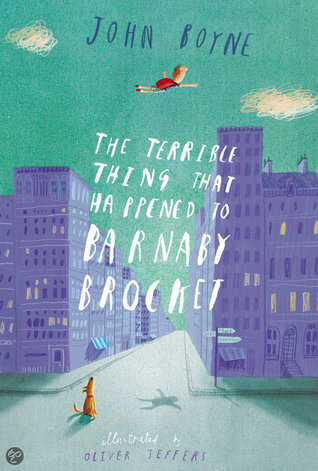 Let us know what’s wrong with this preview of The Terrible Thing That Happened to Barnaby Brocket by John Boyne. There's nothing unusual about the Brockets. Normal, respectable, and proud of it, they turn up their noses at anyone strange or different. But from the moment Barnaby Brocket comes into the world, it's clear he's anything but ordinary. To his parents’ horror, Barnaby defies the laws of gravity - and floats. Desperate to please his parents, Barnaby does his best to keep both There's nothing unusual about the Brockets. Normal, respectable, and proud of it, they turn up their noses at anyone strange or different. But from the moment Barnaby Brocket comes into the world, it's clear he's anything but ordinary. To his parents’ horror, Barnaby defies the laws of gravity - and floats. Desperate to please his parents, Barnaby does his best to keep both feet on the ground – but he just can't do it. One fateful day, the Brockets decide enough is enough. 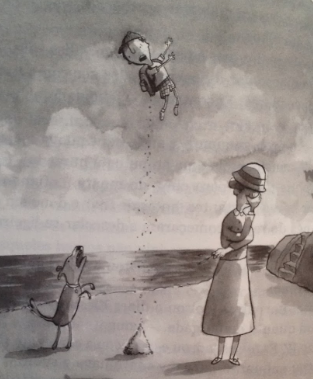 They never asked for a weird, abnormal, floating child. Barnaby has to go . . .
To ask other readers questions about The Terrible Thing That Happened to Barnaby Brocket, please sign up. Is this book suitable for a teenager? Mdaly There are much better books that this for teenagers. Don't waste their time with this. Estou aqui, abraçada com esse livro. Só sei dizer que foi uma experiência maravilhosa. A história e as mensagens me tocaram muito e fiquei super emocionada. Um livro que tem a premissa de um menino que é diferente, ele flutua. Já começou genial. E os desafios que ele passa e as pessoas que ele conhece, ensinam coisas pra ele e pra gente. Livro que depois que acaba fica com a gente no coração! Obrigada pelo presente, Vitor! Esse livro precisa mesmo ser espalhado para o mundo! ❤❤ Estou aqui, abraçada com esse livro. Só sei dizer que foi uma experiência maravilhosa. A história e as mensagens me tocaram muito e fiquei super emocionada. I got this book through a goodreads giveaway and hoped that it might spark a renewed interest in reading in my maths/science obsessed daughter. After reading the blurb and flicking through it she asked if we could read it together so we spent the weekend doing just that. 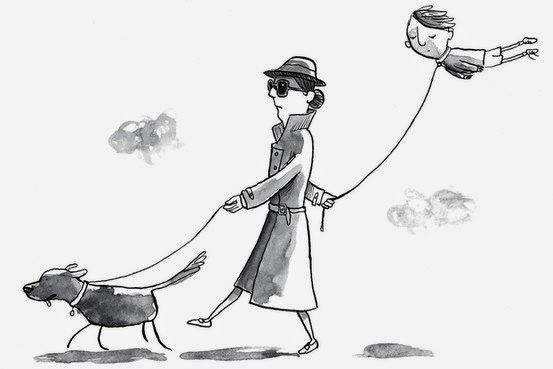 Barnaby Brocket is a boy who can float and goes on some adventures all around the world. It's a typical kids book, however it also has a hidden depth to it that perhaps not all younger readers will appreciate. It makes you quest I got this book through a goodreads giveaway and hoped that it might spark a renewed interest in reading in my maths/science obsessed daughter. After reading the blurb and flicking through it she asked if we could read it together so we spent the weekend doing just that. Barnaby Brocket is a boy who can float and goes on some adventures all around the world. It's a typical kids book, however it also has a hidden depth to it that perhaps not all younger readers will appreciate. It makes you question what is normal and different. Barnaby's parents appear to be 'normal' but in reality are the most intolerant of people and don't like anyone who is different to them including their own child who they eventually abandon. Barnaby meets a variety of characters on his travels who in some way or another have been abandoned by their loved ones for being different but who have been helped by someone with compassion and understanding and so Barnaby does what he can to help others too. Despite what his parents did to him he still wants to get back home to them. "Só porque a tua versão de normal não é a mesma da versão de outra pessoa, isso não significa que se passa algo de errado contigo." Foi o primeiro livro deste autor que li e que melhor forma de começar. É daqueles livros que dá vontade de sair para a rua e destribui-lo a todas as pessoas. Toda a gente deveria ler esta historia e nunca esquecer que temos que aceitar as nossas diferenças, porque são elas que nos tornam especiais. Uma história muito linda, que fala sobre todo tipo de diferença e que passa uma mensagem linda de que tudo bem ser diferente. Teoricamente é um livro infantil, mas eu recomendo pra todo mundo. Um daqueles livros que aquece o coração e deixa a gente com um sorriso no rosto nas últimas páginas! Tohle bylo neuvěřitelně milé čtení! Úsměvné a zároveň poučné, pro děti i hravé dospěláky, doplněné o ilustrace. No recuerdo haberme reído y frustrado tanto a la vez con un libro. Ha sido genial. Tiene un toque cómico que se agracede, e incluso me recordaba a Matilda en ciertas ocasiones (una cucada de libro). Muy recomendable para pasar el rato echándote unas risas. This book was definitely interesting; meant for children but highly packed with valuable morals people of all ages need to be reminded of. The main moral: its perfectly fine to be different. I've read Boyne's Noah Barleywater Runs Away, so I wasn't surprised with certain fantasy and illogical elements being written about. Being very used to YA and adult books though, I had to keep reminding myself that it's a children's book so its perfectly okay to read about a boy who can float and travels arou This book was definitely interesting; meant for children but highly packed with valuable morals people of all ages need to be reminded of. The main moral: its perfectly fine to be different. I've read Boyne's Noah Barleywater Runs Away, so I wasn't surprised with certain fantasy and illogical elements being written about. Being very used to YA and adult books though, I had to keep reminding myself that it's a children's book so its perfectly okay to read about a boy who can float and travels around the world when the terrible thing happened to him. The writing definitely had character and style, and having lived in Australia before it was nice to be able to understand certain references. Is there no end to the talent of John Boyne? The Boy In The Striped Pyjamas = incredible! Noah Barleywater Runs Away = amazing! If you have read either of Boyne's previous books for younger readers then you will know what to expect from Barnaby Brocket - a heart warming and uplifting tale that will tug mercilessly at your heartstrings, with some pretty heavy themes that are woven into the story with humour and deftness of touch that make the book suitable for the both younger audience at which it is aimed, and every age group onwards. You would also know to expect the unexpected. If Alistair and Eleanor Brocket have on goal in life it is to be normal. To have normal jobs, live in a normal house and have normal children. They certainly do not want to do anything that makes them stand out from the crowd. They are mightily happy as the first two children born into the family prove to be normal to the core, but it is when the third comes along, the titular Barnaby, that the foundations of their world of normality are well and truly shaken. Unlike that of his siblings, Barnaby's birth is not an easy one for his mother, and then when he is born the doctor and nurses step back in amazement as he floats up to the ceiling. From this moment on we begin to see just how terrifyingly ghastly his parents can be in pursuit of their goal, as they try to deal with having a child who is as far from normal as can be. And their comes their ultimate act of betrayal as parents - abandonment. At this point, Barnaby embarks on a journey that sees him travelling around the world, encountering a host of other "different" people along the way. Although the premise of a boy who somehow defies the law of gravity seems somewhat fantastical, at the root of the story is the concept of being normal, and what happens to those who don't necessarily conform to society's ideals of exactly what constitutes normality. Barnaby's "difference" is that he floats, but for many others it could be a disability, a desire to follow an unusual dream, or simply wanting to do something different from the wishes of a parent. As Barnaby meets person after person who at some point have dared to be different, and are proud of the decisions they have made in life, his own feelings regarding his 'affliction' are shaped, even though all he really wants is to get back to his parents back in Australia. Yes, the thoroughly nasty parents who abandoned him. To describe Barnaby Brocket as Dahl-esqe is I feel very appropriate. John Boyne has again created a protagonist and host of supporting characters, both good and bad, that will enthral readers, young and old alike. As this book is written for younger readers then the bad characters are very obviously very bad, just as the good characters that Barnaby encounters are obviously very good. There is also a very strong moral running through the story, that may possibly seen exaggerated to the more older and cynical reader, but are an essential part of this as a story for kids (does anybody criticise the morals behind the likes of Matilda or Charlie and the Chocolate Factory? I think not). This is quite a sad book. But if I'd read this as a child I think it would have been a wonderful adventure. To float, to go anywhere, to inadvertently travel the world and meet so many different characters, it would have been wonderful. This book teaches some great lessons - the most important are that it's not wrong to be different and that everyone has their own definition of normal This is quite a sad book. This book teaches some great lessons - the most important are that it's not wrong to be different and that everyone has their own definition of normal. It's OK to be gay, to have a crappy job, to be horrifically scarred, to be a freak. Adorei a mensagem do livro, e acho um livro super indicado para os jovens. E mesmo para os grandes, para refletirem um pouco nas suas atitudes. Compreenderem que temos que aceitar toda a gente, mesmo que sejam diferentes ou façam escolhas que não são do nosso agrado. é uma historia simples, que flui super bem. The terrible thing that happened to Barnaby Brocket, wasn't really a terrible thing in my eyes, because it made him see how truly special he was. OK, his mother went against any scrap of maternal instinct she might have had and didn't really lose any sleep over what she did, but to be honest, Barnaby was much better off with out his parents. Barnaby was exceptional, clever, mature and thoughtful; the kind of child you would love and adore. The only thing that made him different from other childr The terrible thing that happened to Barnaby Brocket, wasn't really a terrible thing in my eyes, because it made him see how truly special he was. OK, his mother went against any scrap of maternal instinct she might have had and didn't really lose any sleep over what she did, but to be honest, Barnaby was much better off with out his parents. Barnaby was exceptional, clever, mature and thoughtful; the kind of child you would love and adore. The only thing that made him different from other children was that he could float and when he began to float he normally had difficulty stopping. His unique ability made him different and his parents just couldn't cope with it. They were just too nomal, living in Normalville, with every aspect of their life in line with normality. To me normal is boring, so I quickly dismissed his parents and not worth having, reminiscent of Matilda's parents in Roald Dahl's classic. The comparisons to Dahl are well founded, as the story brings back to life the horrible adults, Roald Dahl was so famous for creating. The story has the same kind of magic, that Dahl was so good at breathing into his books. There is also that strong sense of good morals and justice being served to those who aren't very nice. I can almost imagineRoald Dahl nodding his head in approval at such a brilliant contrast to his own work. This book really makes you realise that it is perfectly fine to be different from everyone else. You don't have to follow the crowd, you can be yourself and you won't appear abnormal. Your uniqueness makes you special. I loved the way Barnaby would pay it forward for every kind act that came his way. He never took for granted the help he received from others and always went out of his way to return the favour. With each new person he met, he took away valuable lessons which helped him to love who he was. I adored the illustrations within the book, with the postcards being some of my favourites. Oliver Jeffers excellent art work reminded me so much of Quentin Blake's illustrations which were often used with Roald Dahl's books. John Boyne mě naprosto dostal příběhy Chlapec v pruhovaném pyžamu a Chlapec na vrcholu hory. Od Kromobyčejné pouti jsem čekala zase něco jiného a vůbec mě to nezklamalo. Útlá knížečka na jeden večer představuje příběh Barnabyho, který chytne za srdce. Chování rodičů mě dovádělo k šílenství, ale na druhou stranu se mi líbilo, k čemu to vedlo. Ukázalo se, že prostý dětský pohled někdy obsáhne vše, co je potřeba. A ten závěr.. John Boyne je výborný. (4.5⭐) Que libro del bien. Te hace sentir muchas emociones a la vez, pero más que nada alegría y tristeza. Barnaby Brocket is no ordinary boy as he defies the laws of gravity, floating off if he isn't physically restrained. His parents cannot accept his differences and go to extreme lengths to keep him grounded, physically and mentally. One day, Barnaby floats away and you hope he will experience better examples of humanity once freed from the suffocating normality of his earth-bound family. Before I got the opportunity to "meet" Barnaby he was kidnapped by my two children, aged 8 and 12, and both wer Barnaby Brocket is no ordinary boy as he defies the laws of gravity, floating off if he isn't physically restrained. His parents cannot accept his differences and go to extreme lengths to keep him grounded, physically and mentally. One day, Barnaby floats away and you hope he will experience better examples of humanity once freed from the suffocating normality of his earth-bound family. Before I got the opportunity to "meet" Barnaby he was kidnapped by my two children, aged 8 and 12, and both were engaged by this extraordinary boy and equally enraged by the pompous, creativity-quashing attitudes of his parents. "He should have rung Childline" was the general viewpoint! Having received such a positive reaction from the target audience I was delighted to find my own way into Barnaby's world. It's whimsical, charming with a fantastical story which flows so smoothly you can't help but be carried along. There are touches of Dahl and Walliams with quirky characters and dark humour - this feels very much like a modern children's classic. Oliver Jeffers' beautiful cover is the perfect complement to Boyne's excellent storytelling - highly recommended for children age 8+. What a beautiful book and a beautiful story! Barnaby Brocket is a very special boy from the moment he is born. Barnaby Brocket floats, much to the great horror of his parents. And then the terrible happens and he floats away toward adventure. I really enjoyed this book. It was quirky and strange and it's about acceptance of one's weirdness. It had beautiful illustrations that mirrored the mood of the book. Beautifully written and great story. Tämä on kyllä yksi omituisimmista lastenkirjoista mitä olen ikinä lukenut, enkä tällä kertaa tarkoita sitä pelkästään positiivisena asiana. Tuhahtelin älyttömyyksille monta kertaa lukemisen aikana... mutta toisaalta taidan olla ihan liian tosikko, kuten on jo monesti aiemminkin todettu. Suosittelisin tätä kirjaa mielikuvitustaan kahlitsemattomille taiteilijaseikkailijoille. Hauskaa matkaa! Hodně jiná kniha, než bych od autora čekala. Taková pohádkově zvláštní, neobvyklá. Jak by řekli Barnabyho rodiče "nenormální" - i když, co je vlastně normální? Mě nadchla a chytla za srdce, rozhodně byla čtivá, dobrodružně-napínavá. Boyne se opět postaral o to, že napsal knihu, u které jednoduše nemůžete číst, že je určená jen pro děti/mládež nebo pro dospělé. Každý si v ní něco najde. Je to lehké čtení, plné dobrodružství, útrap malého chlapce, a poznávání nových lidí. Všichni mají něco společn Hodně jiná kniha, než bych od autora čekala. Taková pohádkově zvláštní, neobvyklá. Jak by řekli Barnabyho rodiče "nenormální" - i když, co je vlastně normální? I like how the author see 'normal' as a subjective term. What normal for you might not be normal for me and that doesn't make me or you any less normal. All of us is different from one another, be it our appearances, our mind set, our principles and life styles. Nobody is the exact copy of the other, so how much 'normal' can something be for it to be called as 'normal'? Instead of being too quick to judge or punish those who are different than us, why can't we embrace it? That's the colours of life, don't you think so? Being normal isn't necessarily boring and being different doesn't have to be weird. It just how you see things that will change everything. literally everything. After more than a month reading this, (not that its boring or anything, I was just busy) I'm glad that I have finished it! Damn Barnaby, all those adventures that you have and you're just 8 years old! I'm totally on your side kid, who would wanna be normal when you can be different and have a lot of adventures right? RIGHT? Que tipo de pai expulsa um filho de casa? Um romance fantástico e divertido mas que nos leva a refletir. "Un chico que estaba preparado para conocer a gente nueva. Un chico que quería vivir aventuras nuevas. Y lo principal, un chico que estaba orgulloso de ser diferente." 4.6/5 bc of how magnificent the whole story is. i really fond of reading children book like this which makes me thinking not as a grown up but as a human being. Nemůžu jinak. John Boyne si za tento příběh těch pět hvězd zaslouží. Skvěle milé, dojemné, úsměvné čtení, které všem jasně říká, že je v pořádku být mimořádný a vymykat se normálu. Jinak nikdy nezažijete taková dobrodružství jako Barnaby. Comenzaré con un: este libro es un aventura de altura. No quisiera sonar igual que la película UP: UNA AVENTURA DE ALTURA, pero tiene mucho sentido describir este libro de esa manera. La historia nos habla de Barnaby un niño que desobedece a la ley de gravedad y simplemente lo hace elevándose por los aires. Sus padres son unas personajes muy prejuiciosas y les importa lo que los demás piensen de ellos así que tener un hijo que vuela no es algo con lo que quieran liar. Así por cosas del destino (ajam... claro, malvada madre que tiene) Barbany termina volando sin rumbo fijo por los aires de alguna u otra forma siempre alguien lo salva, lo regresa a tierra y lo lleva a vivir una nueva aventura. Por sus dotes de desobediencia Barnaby conoce varios lugares, como N.Y. Irlanda, etc. y ahí conocerá a personas maravillosas que como él que comparten el sentimiento de haber sido rechazados por alguien, los ayudará y al final ellos a él. La historia es digna para leer por la noche a mis hijos (cuando los tenga). Un niño que vuela por el mundo y conoce lugares diferentes día a día, personas nuevas, que digo, la AVENTURA está cada día. Este libro no solo nos da una bonita y sencilla historia de aventuras infantiles. También nos muestra como la sociedad puede llegar a ser tan cruel con respecto a las diferencias en los demás; que si son bajos o altos, blancos o morenos, europeos o americanos, desobedientes a la ley de gravedad u obedientes. Todo mundo es diferente, eso es algo que ya sabemos y muchas veces defendemos, sin embargo esta historia nos pone un ejemplo tan exagerado como el de Barnaby para que podamos llegar a dimensionar cuanto nuestros comentarios, ideas y prejuicios pueden llegar a influir en la vida de los demás. Hablando de los personajes puedo decir que los encuentro algo exagerados, pero entiendo que son así para que como lector no nos quede ninguna duda de los que la historia quiere transmitirnos. No es como que pueda comentarles mucho pues les contaría toda la historia. El libro se lee muy rápido y vale la pena, no se parece nada a El niño con el pijama de rayas (de verdad no sufrirán tanto). I don't really know what else to say apart from, I LOVE this book! It's just one of those rare novels that's heart-warming and sweet in every way possible. You really shouldn't be put off by the almost childish cover (in my opinion, it's so cute!) because this book shouldn't be missed by anybody! It's definitely a book that can be enjoyed by all ages! One thing I adored about this book, is that it reminded me so much of Roald Dahl's books! And who doesn't love Roald Dahl?! Yet again just let me s I don't really know what else to say apart from, I LOVE this book! It's just one of those rare novels that's heart-warming and sweet in every way possible. You really shouldn't be put off by the almost childish cover (in my opinion, it's so cute!) because this book shouldn't be missed by anybody! It's definitely a book that can be enjoyed by all ages! One thing I adored about this book, is that it reminded me so much of Roald Dahl's books! And who doesn't love Roald Dahl?! Yet again just let me stress out, THIS CAN BE ENJOYED BY ALL AGES! Please, oh please, oh please don't dismiss this just because you think it's childish! It's such a unique, one-off story that leaves you with such a warm, fuzzy feeling inside! I literally feel priviledged to have read it! I felt like I was right there with Barnaby, exploring the world with him during the time when I was reading this! He went to so many places and met so many wonderful people who taught him that being yourself is much better than being someone your not. Each person affected Barnaby and vice versa. Whenever I was reading this book, I was smiling to myself. And when Barnaby started to devolp and grow as a character, well that was just the cherry on top! Overall, Barnaby was a very sweet character with a very good heart. It's almost like he saw everything in black and white. He spoke what he felt when he felt like saying it. When your eight years old that's just what you do. You see everything in the most simplest of ways and don't understand how anything could be more complex that that. I adored him and for some reason I really wanted to be the one to keep him safe. Not only did he affect everyone else he met when on his adventures, he also taught me a valuable lesson. His novel John Boyne (born 30 April 1971 in Dublin) is an Irish novelist.